"Without realizing I've designed an alternative to my school uniform" says Mimi Wade of her AW17 collection. Specifically, the corduroy which appears for the first time in a collection by the London-based designer. "At school, the uniforms were so ugly that everyone would put their dark green skirts on a boil wash in the machine 20 times over so they would become a more attractive pale, blue-y turquoise". The same pale, blue-y turquoise features throughout Mimi's collection. And it has a rather intoxicating quality that is steeped in nostalgia and avant-garde goodness. Mimi Wade's collection has always been driven by prints and a whimsical sense of realism. And this collection is an extension of that narrative and ultimately fits in well with her previous collections.The introduction of knitwear is bound to be popular with the in-crowd and overall the collection is a step towards the right direction. 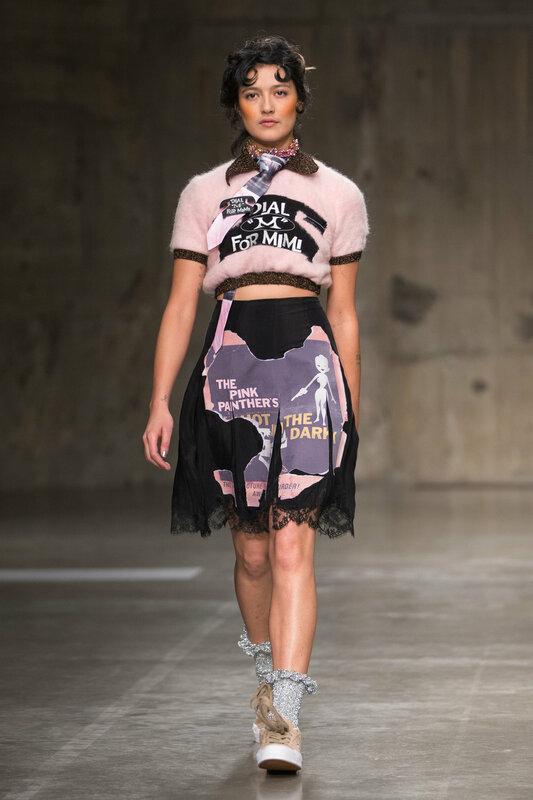 While this is not revolutionary it has enough spark to suggest Mimi's creativity is truly forming into a formidable force and among the young and emerging designers her work is worth a good look.